I've been working a lot of hours the past few days. I don't mind it. I far prefer to work a bit later than get slammed by a big deadline later on. I also don't mind banking a few extra hours to take another day. You can't tax a day off, I always say. When I'm working long hours, it's really important for me to keep some good food nearby. I've learned to divide up food into three types: food for fuel, food for maintenance, and food for treats. Often, these groups overlap each other, but for my purposes, it's a good way to make sure I get everything I need. And yes, I need treats. Food for fuel is mostly high-protein and complex carbohydrates: meat and whole grains. That kind of stuff. It's the stuff that builds muscle and/or gives me energy to keep moving. Food for maintenance is stuff like fruits, vegetables and "good fats" that you find in nuts and olive oil. It's the stuff that keeps my digestion running smoothly, keeps my blood vessels clear, and keeps my hair and skin and nails healthy. Food for treats is stuff like cookies and ice cream and fries and all the stuff you find at a carnival. It's the stuff that makes me sit back and smile when I eat it, but usually makes me feel a bit sick if I have too much of it. I used to really struggle to get enough maintenance food, especially vegetables. Today, I'm proud that I've taught myself to eat at least five servings of vegetables and two servings of fruit a day. It wasn't easy, and I didn't set out to get that number. The vegetable consumption increased when I started working at my current job. I needed something to do with all of my nervous energy while I'm concentrating hard at my desk. I figured that, if I was going to chew on something, far better for it to be something like vegetables than cookies and candy (though the candy bowl at work gets frequent visits from me as well... ahem...). 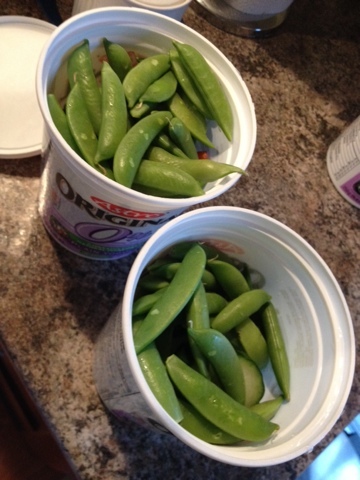 So here's a shot of the two large yogurt containers of vegetables I prepared for the next two days of work. This, along with the other fuel-type food I take with me, will keep me going during the long days at work. No matter what else I eat each day, I can at least feel proud that I gave my body something to keep it running smoothly.